Last Wednesday the SCRL were pleased to welcome Francesca Selva, an 18 year old Italian rider currently studying in Brighton. Francesca has been in Brighton for a while but has only just discovered the velodrome. At her home, near Venice, she has both an outdoor track and indoor velodrome for racing. Although the only female rider on the evening she proved fit and competent with Italian support from the stand, and even a brief Italian commentary over the tannoy. 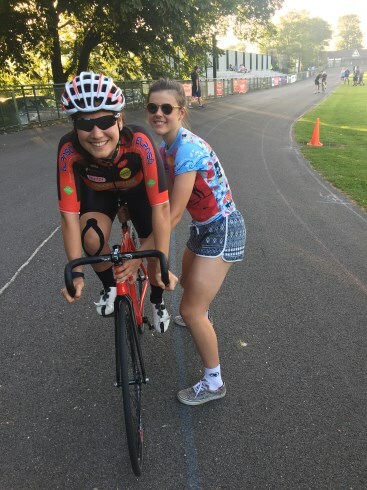 The photo shows Francesca being pushed in the handicap by Izzy Stone who has also raced league this year; though has been more focused on A Level exams and racing in Belgium.